Select which screen mode (single, double, triple etc.) the Analysis section will start in when SportsCAD is opened (by default SportsCAD starts in single screen mode. If you always use 4 windows, switch this setting to Quad Screen). Select whether your Open Videos dialog box opens down the left side, down the right side, or in the middle (classic style). When the Slow Motion button is pressed in the Analysis section, the default slow motion speed of the video is 25% of the original speed. You can speed up or slow down the default setting by sliding the scroll bar. You can change the color of any of the drawings tools. Click on the tool that you want to change the color, select the new color, and choose "OK". This has no effect if the Drawing Colors are set to Randomize Colors (see below). Select Single Colors to have all of your drawings as a single color (All drawn lines are blue, all drawn circles are red etc). 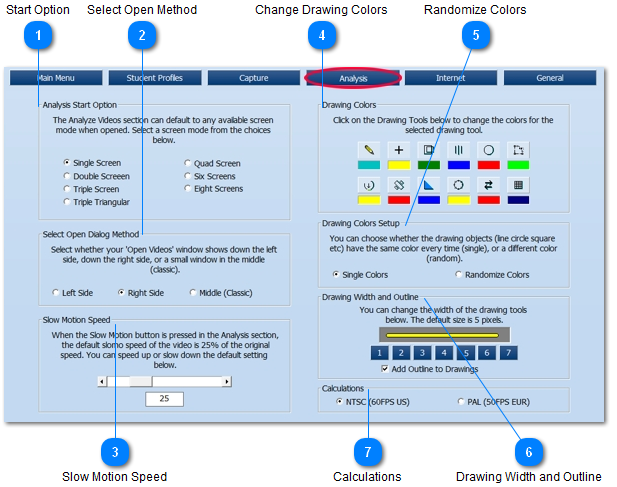 Select Randomize Colors to have the colors switch every time a new drawing is added. You can change the width of all of the drawing tools. The settings range from 1 (thinnest) to 7 (thickest). You can also decide whether the drawings have a black outline. Select NTSC for USA and Canada.